If you're looking for the best Nintendo Switch headset, regardless of your budget, you've come to the right place. While the price of the best headsets out there may seem intimidating, you don't have to spend top dollar to get a Switch headset with great audio and superior comfort. You just need to know what to look for, and how to find a good deal when you're in a position to buy. That's what this guide to the best Nintendo Switch headsets is all about. If you're looking for ultra-portability, the Turtle Beach Battle Buds are great value at $30 / £25. Here's our review. So what makes for the best Switch headset? Audio quality is a big concern - you want the best Switch games to sound as good as possible - but you also need to consider comfort, portability, and the versatility of your headset. If, for example, you use your Switch for play outside the home, you want a pair of cans that you can easily carry with you. And if you're using the Switch as part of a range of travel options, you need a headset that will perform well not only with Zelda Breath of the Wild but also with other media, like music, movies and TV, so you can happily swap between Switch and a tablet or phone screen. Finally, you need your headset to be comfy and great value - there's no point getting something that makes your ears hurt, or your wallet. With all that in mind, here are the best Nintendo Switch headsets available in 2019, at the lowest prices on the internet. Yes, the Cloud has been around - and winning awards - since all this was fields (*gestures hand). And yes, there’s a very good reason for that. Somehow, time after time, HyperX manages to hit an incredibly attractive pricing while putting together the most comfortable cans on the market, bar none. It all began with Swedish manufacturer QPAD’s QH-90s, which Kingston bought the rights to several years ago. While the sound quality has improved noticeably and the features have grown with every new iteration, the Cloud features the same trademark design, inspired by aviation headsets. What that boils down to is that they’re incredibly comfortable and great and blocking out exterior sound too - useful if you’re on the go. The sound characteristics of the Cloud Alpha are bassier than we’d usually like, but in this case the low-end power doesn’t come at the expense of high-end articulation. They’re a real all-rounder, as suitable for music or movies as they are for building a perplexing maze around your enemies in Fortnite. Speaking of socially focussed games like Epic’s battle royale: the mic quality is… fine. You’ll have no trouble being heard, but it’s a bit thinner than some other on the list. Streamers should use a dedicated mic instead. If you're looking to really save cash on a Switch headset, this is your best option. Clocking in at $40 / £30, you get everything you need from a gaming headset in one neat package. A decent mic? Check. A comfy headband design? Check. Efficient 40mm drivers that deliver good gaming sound and decent levels of bass? Check. It even looks pretty good on your head, and the mic can be flipped up to keep it out of the way while you're playing offline. The drawbacks of the Recon 70 are exactly what you'd expect for the price. It's tuned for gaming, so doesn't transfer as well to movies and TV, although the bassy drivers do mean it's pretty good for most types of music. It's also less comfy for longer gaming sessions of over two hours, which shouldn't be an issue if you use your Switch for commuting and shorter journeys. Aside from these gripes, you're getting a really solid, reliable, and decent performing headset for a bargain price. You'll likely see variants like the Recon 70P and X etc - they're all the same headset, but with slightly different colors for different consoles. Each one works with Switch, via the 3.5mm jack. The Arctis range of headsets specialise in wireless tech, but there’s a 3.5mm cable supplied with the Arctis 3 which makes it fully compatible with Nintendo Switch. As a bonus, however, the Bluetooth version allows you to connect to other devices while you're playing, so you can listen to music on your phone while exploring Zelda, or you can make and receive phone calls during a heavy Fortnite session. Featuring Steelseries’ now trademark ‘ski goggle’ headband design, the Arctis 3 keeps the weight off your head using an elasticated band that - bonus! 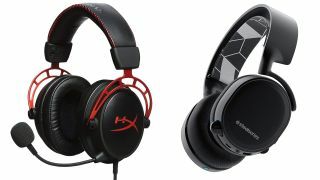 - you can swap out for a jazzier design from Steelseries’ online store if you so desire. More importantly, it makes this headset comfortable and portable, with no horrendous RGB lightning to distract your fellow commuters when you plug in in public. How’s the sound? Less bass-heavy than the Cloud Alpha, but still powerful enough to bring your games alive, and with a nice stereo spread that brings out the details in multiplayer shooters where locating footsteps and the barely perceptible clink of a pulled flashbang pin are vital. The cable isn’t as sturdy as other offerings, lacking any kind of braiding, so wear and tear during travel may become an issue over time. But that’s really the only drawback in an otherwise versatile option for Switch sound. If you’re looking to game on the go without drawing too much attention to yourself, the headsets don’t come much more understated than Logitech’s eSports-inspired G Pro. Gone are the tribal patterns, the seizure-inducing RGB, and the preposterous ‘aggressive’ angles that so often characterise gaming headsets. In their place, a monochromatic design with subtle ‘G’ branding on each earcup that wouldn’t look out of place in a high end audio boutique. Sound quality isn’t quite as luxurious as the kind of audiophile headphones you’d find in said boutiques, but it’s more than up to the job for gaming. If you like a flatter response, the bass levels here might be slightly too aggressive for you, but most people will find the warmth and articulation just right. Perfect for popping on a few tunes after your gaming session. In terms of portability these are a light and robust pair of cans, but they’re not quite as effective at blocking out exterior sound as the Cloud Alpha, so beware the sound of someone loudly eating their Burger King on the table across from you bleeding into your game audio. Back into more familiar gaming headset design territory now with the GSP 550, which looks like it fell off an absent-minded Borg’s head and costs the earth. That’s admittedly not the most effusive introduction to a product we’re heartily recommending, so let us explain. Sennheiser are absolutely brilliant at microphones. You’ll find their pro audio equipment in any recording studio you care to name, and that ultra-high-end expertise trickles down to the gaming headset market beautifully when it comes to small but full-bodied mics. This has been the case for years, but packaged together in this GSP 550 with such incredible sound reproduction, it’s a no-brainer for those looking to take their Switch out to play, and keep chatting to their friends while they do it. This is your best bet if you want to put fidelity first. Roccat's Khan Pro doesn't feel like the most luxurious headset on our list, but the build quality and construction materials have come on a long way in recent years for the German manufacturer. And besides, the USP here isn't a pampered scalp, but luxuriated ears. High resolution audio is a slightly wooly term that's most simply defined as 'anything above CD quality’, or 44,000Hz. In truth it takes something of an audiophile's ear to appreciate the difference, but if you like to combine Switch sessions with music binges with high-res music services like Tidal, the Khan Pro's got your bases covered for relatively little outlay. These are a light, compact set of headphones too, and although the large Roccat logo does give the game away slightly that these are for gaming, it’s thankfully rendered in dark grey so you can *just about* get away with it on planes, trains, and automobiles, as the case may be. Beyerdynamic, like Sennheiser, are a big name in pro audio. Their studio headphones have been found around the ponytailed necks of sound engineers for many a decade, and their mics in front of many a guitar amp. The Custom GAME is a big deal, then, because it brings much of that pro audio nous to the gaming space. For starters, the aesthetics are bang on. Taking cues from its DT series of studio headphones, and perhaps a dash of the aviation cans that spawned the HyperX Cloud Alpha, this headset looks subtle, professional, and far more expensive than it is. The headband’s generously padded to keep discomfort at bay, and so are the earcups, which keep exterior sound out brilliantly. The sound is warm, crisp, and with a flat response that’s hard to find from gaming cans. You’ll certainly hear the details with these around your ears, and if you want to get granular you can use a control on the earcup to cycle between 4 EQ presets intended for different environments. The mic works wonderfully for such a small unit, too, producing a more full-bodied voice than most. In short: this is the full package. It’s pricey, but useful for gaming, music, cinema, and even editing or production. If you don't want a traditional gaming headset, because it doesn't fit with the portability of your Switch console, then grab a pair of Turtle Beach Battle Buds. While they don't deliver superior audio, given they only have tiny 10mm drivers, they're rather good at what they do, and because the frequency response is quite limited you actually get a good balance of sound no matter what you're listening to. While most gaming headsets suffer when handling dialogue in games and TV, the Battle Buds deliver a nice, consistent sound. Despite their size, the Battle Buds stay firmly in your ear, even with constant head movement, and they're comfy for at least an hour of play. The Battle Buds also include a tiny mic, if you want to chat while playing, and they come with a neat little carrying pouch. Crucially, all this kit will fit easily into the average Switch carry case, and because the pouch is a nice, soft material, it won't scratch your screen or mark it in any way. They're the perfect portable option for Switch, if sound quality isn't a huge concern.